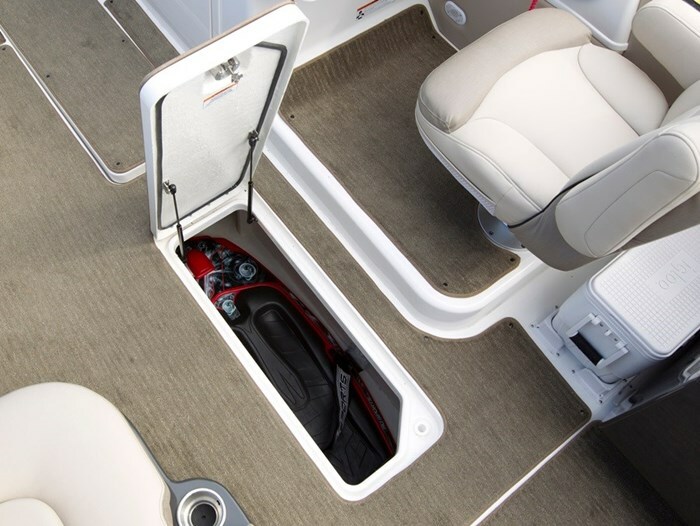 The all new for 2015 Element XR7, at twenty-five feet, six inches length overall, is the biggest boat offered this year by Bayliner Boats, a Brunswick Corporation Company. 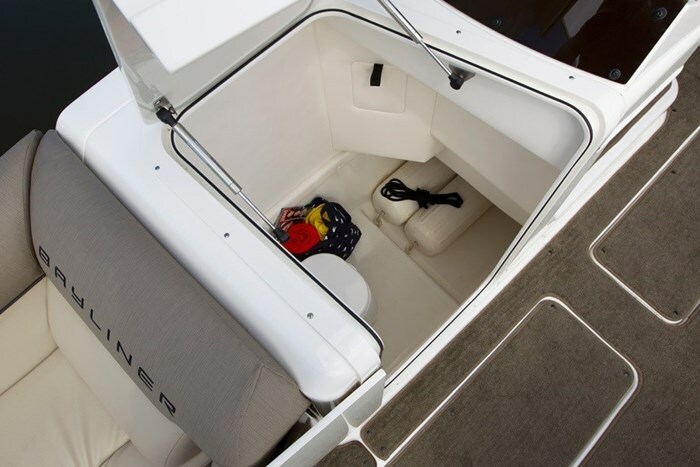 In all, Bayliner offers sixteen models from sixteen to twenty-one feet in four series of bowriders, deckboats, one overnighter cuddy cabin, plus three models in this Element series, the other two being sixteen and eighteen feet. Except for the starboard helm console plus the centre bow, stern, and portside entrance gates leading to the full-beam, one-level interior floor space of the Element XR7, the entire interior perimeter of the boat is devoted to seating. In fact, it has a maximum capacity rating in the US to carry sixteen persons on board and there is available seating for all. 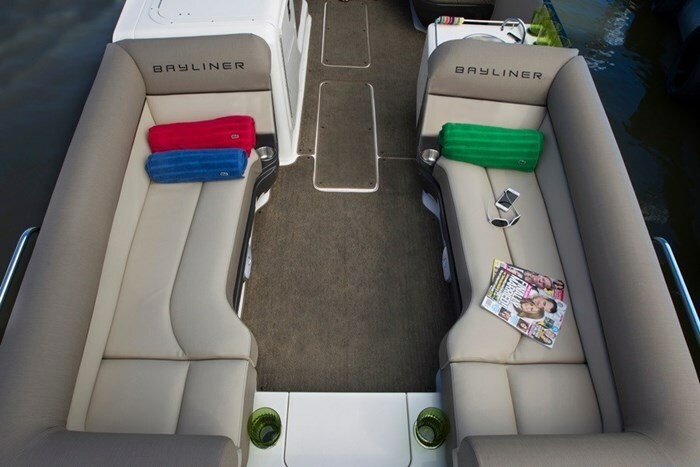 Facing port and starboard bench loungers in the bow are each two or three-seaters. Similar facing port and starboard loungers in the stern are each three or four-seaters. 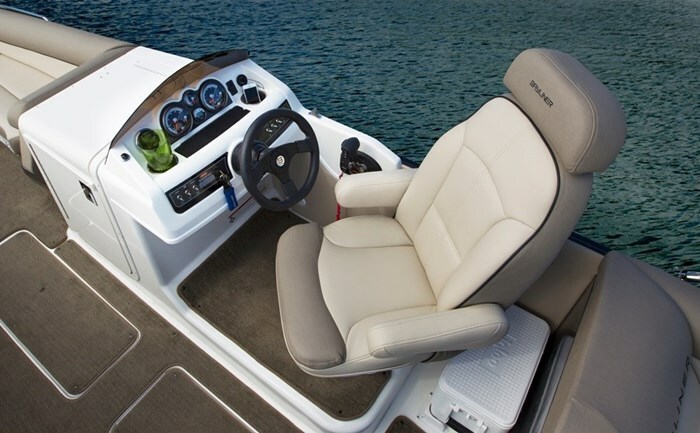 A standard low-back swivel helm bucket seat accommodates the driver and opposite this seat on the port side immediately aft of the portside entrance gate is a forward-facing companion seat affixed to the forward end of the aft port lounger. All lounge seating has storage beneath the seat cushions and all loungers have well padded backrests to accommodate both forward and aft-facing lounging. 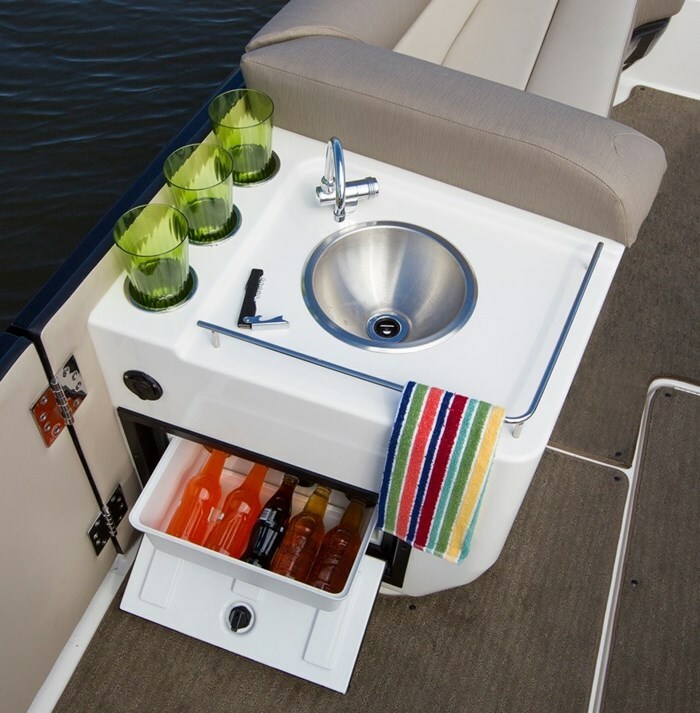 On the aft end of the port bow lounger and just ahead of the portside entrance gate is a standard fibreglass molded entertainment center which may be optionally outfitted as a wetbar with stainless steel sink, faucet, and 10-gallon fresh water tank. Also available is a drawer style refrigerator for this entertainment center. On the opposite side behind the driver’s helm seat with dedicated floor retainers is a standard carry-on portable 25-quart cooler. The fibreglass molded driver’s helm console is raised about five inches above the floor to not only provide greater sight lines for the driver but also to provide increased headroom within the standard equipment integrated lockable head/change room compartment ahead of the helm. Lots of useful storage is available in here for fenders, lines, etc. and a porta-potti is optionally available. Storage for watersports accessories, etc. is available within not one, but two standard in-floor compartments with gas-assist hinged covers. Ahead of a padded, tilting steering wheel, the driver’s helm with windscreen is well laid out with custom molded dash panels with a non-glare brow and standard outboard instrumentation consisting of speedometer, tachometer, fuel and trim gauges, plus volt and hour meters plus a 12-volt accessory outlet. A 120-watt AM/FM stereo with iPod and MP3 connectivity is also standard equipment. Standard outboard power for the Element XR7 is provided by a 150 horsepower Mercury® EFI 4-Stroke. 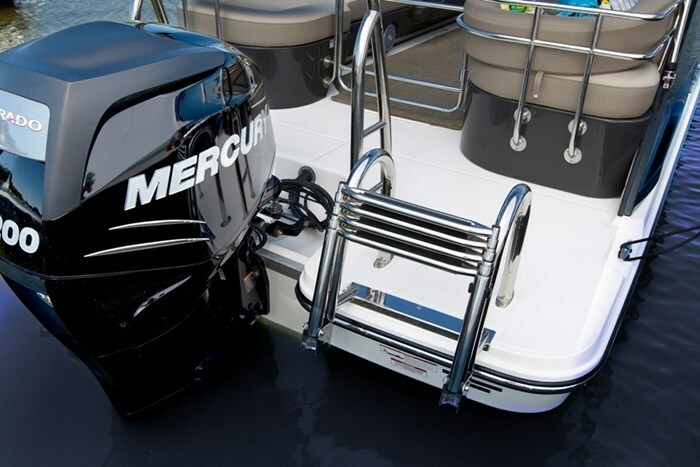 Optional power is available from a 200 horsepower Mercury® EFI 4-Stroke Verado® four-cylinder. 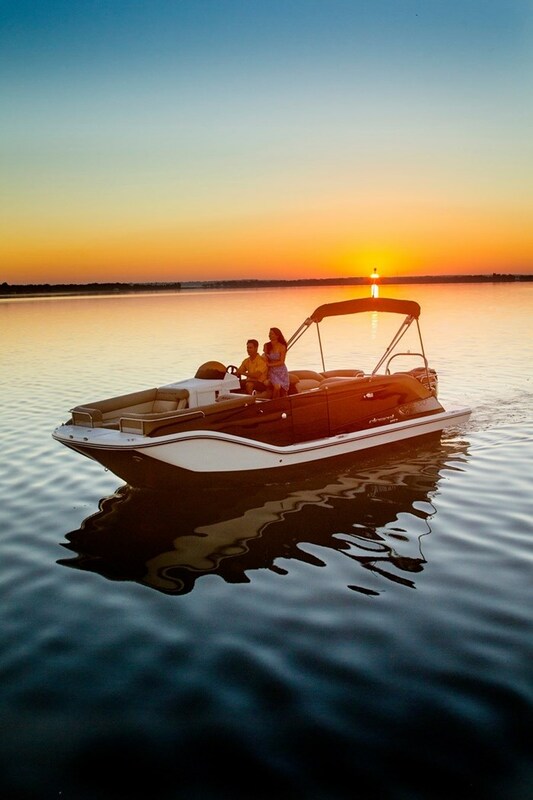 Bayliner suggests a cruising speed of 21-22 mph and top speed with the 200 of 38-40 mph. 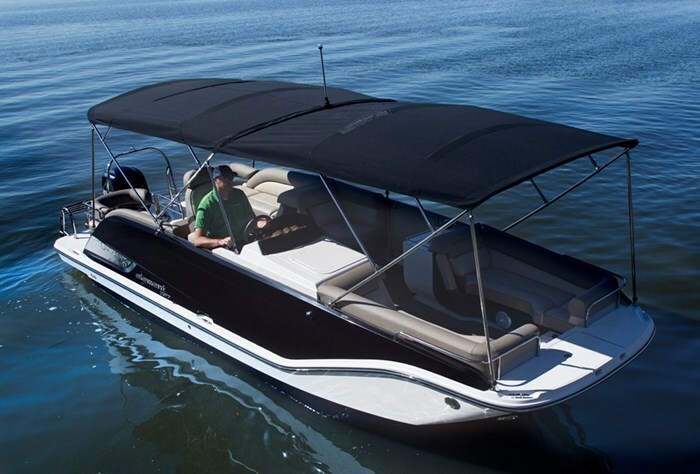 Other notable standard equipment includes a stainless steel four step telescoping stern boarding ladder with handrails, a bimini top with storage boot, ten cupholders, glove box, dedicated anchor locker, and a full-width walkaround integrated, molded transom platform. Notable optional equipment includes a four step stainless steel telescoping bow beach access boarding ladder within a recessed and covered storage well on the integrated bow platform, cockpit carpet runners or Seagrass snap-in floor covering, docking lights, LED interior and underwater lights, ski tow bar, battery charger, forward bimini top, plus two available helm seat upgrades, plus a black painted or galvanized tandem axle trailer with disc brakes and Swing-away tongue.